When in doubt, make pesto. It is hard to have leftover pesto sauce, because I love it so much that I find myself using every last drop that I can muster out of the food processor. Somehow, I found myself with enough for two nights. On night two, I seasoned my shrimp with salt, pepper, and minced garlic and threw them on a grill pan with a little olive oil. I roasted one or two whole red peppers doused in a little olive oil. I like to cover the pepper when I want it to steam and hold in its spicy juices, so that after 40-55 minutes, the house smells like peppers, the pepper itself is ever so tender, slippery, and oozing with natural juices, and its skin is coming off with just a little nudge from the tip of my knife. Slice the pepper into 1/2 inch pieces. Remove the pepper’s skin if you prefer more spice and a softer vegetable. Leave the skin on if you prefer each piece of pepper to have a little more shape, or if you’re simply feeling lazy. When the pasta is al dente, toss it with olive oil and a little grated Parmigiano Reggiano so that the pasta doesn’t stick. 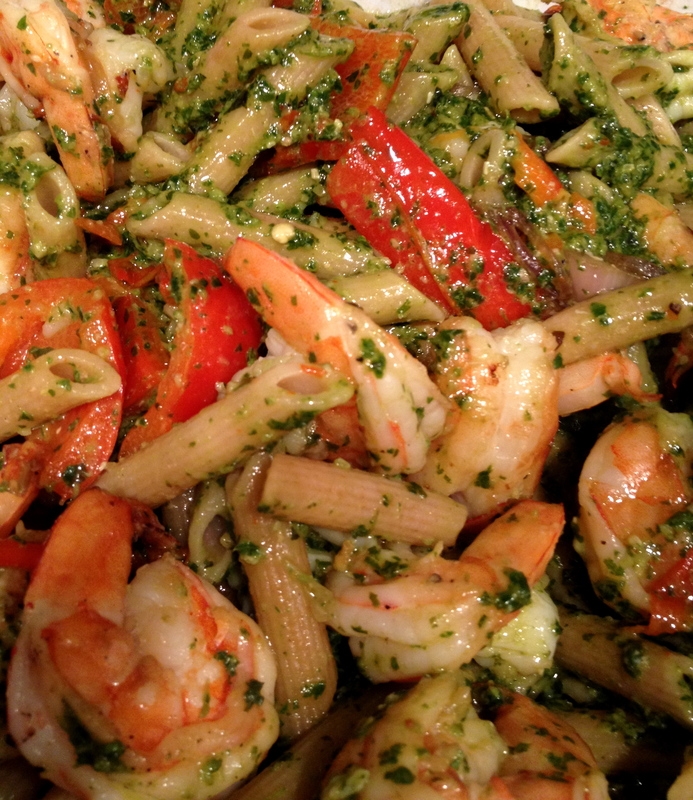 Toss in the grilled shrimp and the peppers and then mix in the pesto. Add a little reserved pasta water to make it more of a sauce. Et voila, it’s pesto night again. 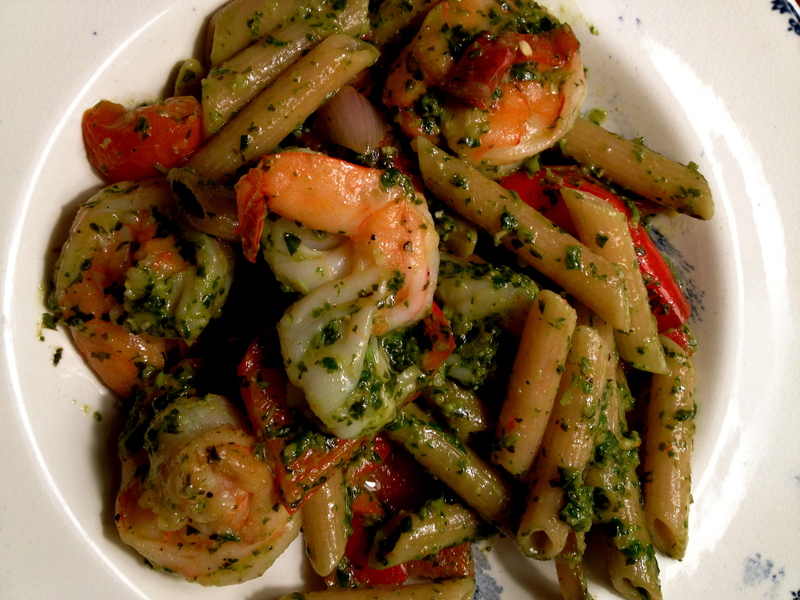 Combine the basil, salt, and garlic in the food processor. Slowly add two tablespoons olive oil through the feed tube, blending as you go. When a coarse paste forms, toss in the pine nuts and mix. Slowly add the remainder of the olive oil through the feed tube, mixing as you go. Then add the grated Parmigiano and mix. Add a dash more olive oil or Parmigiano to taste.